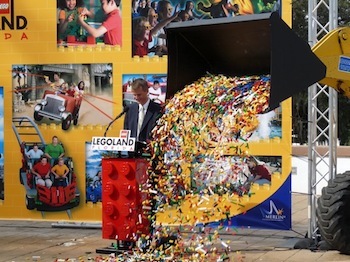 Today Merlin Entertainments announced a multi-million dollar investment for its biggest family tourist center in the world with the planned opening of Legoland Florida. Merlin purchased the historical Cypress Gardens in Winter Haven, Fla. from property investment company Land South Group and will open Legoland Florida on the site at the end of 2011. The deal to buy the 145-acre site includes the current theme park and waterpark as well as an operating lease in perpetuity on the historic botanical gardens. Merlin plans a significant multi-million dollar investment over a number of years, up to and beyond opening, in what will be the biggest Legoland to date. In line with the group’s “resort” strategy for its theme parks, this is likely to include both accommodation and the addition of further branded attractions from the Merlin portfolio. This will build on the $100 million invested over the last few years in improved infrastructure on the site. The Florida development will be Merlin’s second Legoland Park in North America. It will provide a full-day, year round, theme park experience geared towards families with children between the ages of two and 12. Its design will mirror the successful concept of the four existing Legoland Parks in Denmark, Germany, U.K. and California. However, as with the other four, it will also have its own unique “twist” reflecting its stunning location and adding a Florida flavour. The decision to open a Legoland Park in Florida follows considerable research in the area by Merlin over a number of years. 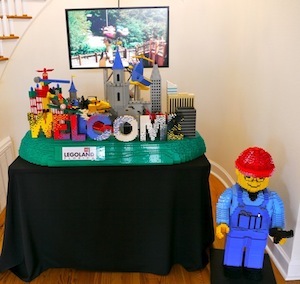 This indicated a high recognition of the Legoland Park brand and a 90 percent plus intention to visit by families in this target market. The issue has been to find the ideal site. Cypress Gardens has long been a popular location for millions of visitors. Merlin believes its Central Florida location, approximately 50 minutes from Orlando and also close to Tampa, is the perfect site for Legoland. The development follows the success of Legoland California which opened in 1999. Legoland California was recently voted the country’s best children’s theme park by “Amusement Today” for the sixth year running. It is also recognized as the fastest growing theme park in the U.S., enjoying an increase in visitor numbers year-on-year, including six percent in 2009. Legoland Florida will be the biggest Legoland Park ever opened and will offer a unique mix of more than 50 rides, shows and attractions, including spectacular Lego models and other interactive elements for the whole family to enjoy together. The Legoland makeover will take approximately two years. They’re expecting to open at the end of 2011. Why open it in Polk County? Officials said they visited Cypress Gardens in past years and fell in love with the place. They explained that their other theme parks are located on beautiful grounds. They looked at many locations in Orlando but ultimately chose Cypress Gardens. They also added that if they had built from scratch on another location, it would have taken them five or six years. Yes. They stressed that they will keep the beautiful gardens. What about the Southern Belles and the Florida shaped pool? They haven’t decided if they’ll remain yet or not. Will they keep the water ski shows? They haven’t decided for sure, but they hope to. They think the water ski show could easily be themed with the Lego brand. Will the Cypress Gardens name remain? Maybe in some form. The location will be called Legoland Florida, and eventually Legoland Florida Resort. 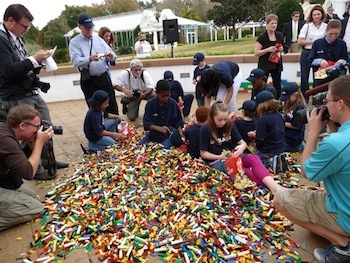 They are thinking about calling the gardens part of Legoland “Cypress Gardens”. If so, you’d go to Legoland Florida to visit the Cypress Gardens. How many attractions will there be? Somewhere around 50 all together. This includes rides and shows. Will any of the Cypress Gardens rides remain? What about the wooden roller coasters? Some of Cypress Gardens’ rides have already been removed. Some of them have been sold but not moved off property yet. Officials said they will probably keep some of the rides and retheme them. They are thinking about keeping one of the wooden roller coasters but didn’t say which one. Will a Legoland hotel be built? They plan to eventually build an onsite hotel, but not until a while after the opening. The property is about a 45 to 55 minute drive from Downtown Disney. From Orlando, you would take I-4 West to exit 55, (U.S. 27 South), then turn right on Cypress Gardens Boulevard. It’s an easy drive if I-4 traffic isn’t bad. Will they offer promotions with other Central Florida theme parks? They hope to. They said they’re willing to work with any of the other theme park companies including Disney. Will the water park remain? Will it become a Legoland waterpark? Yes, the water park will remain. It won’t become a Legoland Water Park right away, but if their upcoming first Legoland Water Park, which opens in California in June, does well, they may bring it here. Will the waterpark be included with admission to Legoland? No. It will require a separate ticket. How much will ticket prices be to Legoland? They haven’t announced prices yet, but a current one-day adult ticket to Legoland California is $67.